The Secret is in the Sauce: Recipes! : Guest Blogger- Little Momma & co.
We are Tiffany and Heather, two self proclaimed "comment junkies" who started "The Secret Is In The Sauce" as a forum to promote bloggers and shower them in comment support. Guest Blogger- Little Momma & co. Sometimes, I just crave a good chinese meal. But, beyond stir-fry-- I have never attempted anything else. I found a little Asian market in my town that has inspired me to try new things. I love to go there and just marvel at all the unusual and beautifually packaged ingredients. I started small, wonton wrappers and fresh ginger-neither of which I had tried previous. 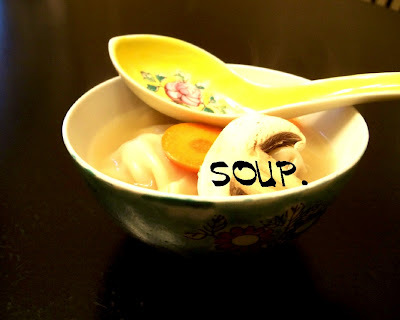 A friend of mine passed this wonton soup recipe along to me and my family adores it. And funny enough, it's even better the SECOND day! Combine the broth, water and ginger slices. Cover and bring to a simmer. Turn off the heat and let it sit. Wash the bok choy and cut into thin slices, set aside. Combine all ingredients for the wontons, except the wrappers. Mix well (I used my hands). Remove wontons from their package but keep covered so they don't dry out. To assemble the wontons: with your finger, wet all 4 edges of the wrapper. Put a teaspoon of the filling in the center and fold it over to look like a triangle. Make sure edges are sealed no air is left inside. Take the two bottom corners and pinch them together with a little water. Put finished wontons on a cookie sheet covered with plastic wrap until you are ready to use them. Bring your broth back to a boil. Add the wontons a few at a time, keeping the broth at a low boil. Cook for 7 minutes. 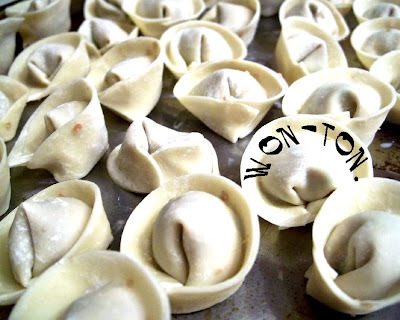 Open a wonton to make sure the meat is cooked through. Add the bok choy and cook for another 3 minutes. Add pepper to taste. When serving, remove the sliced of ginger from the broth and discard. I love a good fortune cookie. 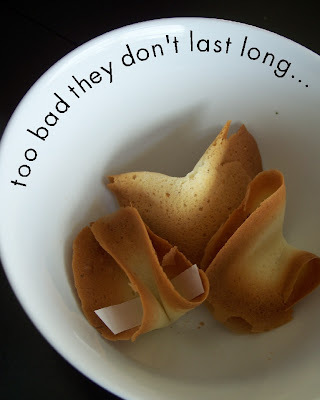 I have wanted to make fortune cookies for YEARS and never felt like I could do it. They were intimidating to me. Folding something that was already so delicate and paper thin. It sounded too tedious. But, one day I decided to try, and found out that it wasn't so hard after all! Nothing, ABSOLUTELY nothing bad can come from sugar and egg whites. They were so easy, I even decided to share! In fact, the only problem that I encountered with these cookies were the fact that they disappear quickly!-- They even kept my boys busy. 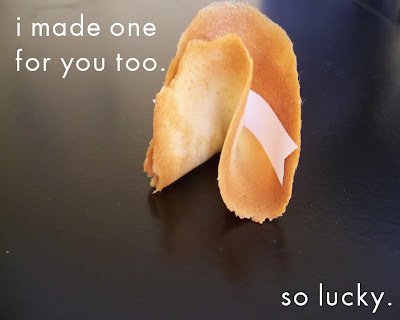 I cut out dozens of little paper strips and let them make the fortunes. They don't write too well yet, so I was so smitten with the little kitty cat picture I found in one of mine! 4 T melted butter, cooled. Preheat oven to 350 degrees. Grease a cookie sheet thoroughly.Whip the egg whites until light and foamy. 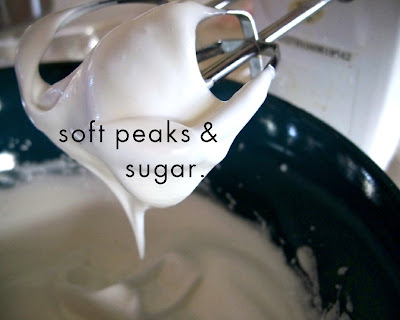 Blend in sugar and continue to beat to soft peaks.Pour in butter, flour, salt, and extracts; mix well until combined. Drop a tablespoon full onto the prepared cookie sheet. Using the back of a spoon, spread batter into a very thin 3 inch round. Just bake 2 or 3 at a time, they harden fast. Bake for about 5 to 8 minutes, until the edges are a light golden brown. Remove the cookies with a spatula. 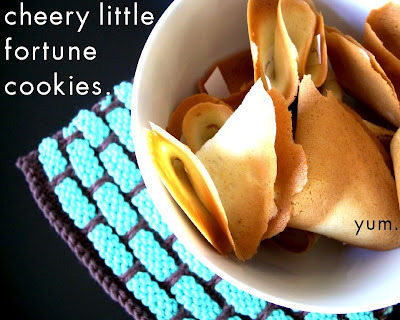 Lay a fortune in the lower middle of the cookie and gingerly (they are hot!) fold in half to make a semi circle. Bend the edges up toward each other to make a crescent. Cool in a muffin tin to maintain shape until crisp. Repeat with remaining batter. Come on over and visit us! Click here! Chinese food recipes have always REALLY intimidated me too. Now I'm feeling a little braver. I want to go wander around the Chinese market now. That won ton soup looks delicious!! I love chinese cooking !! I have this thing for fried wontons. They make my heart sing. Well, they are probably suffocating my heart, but they do make me happy. And the wonton soup looks delish. Will have to try that when our weather gets a smidge cooler. Because the idea of eating soup when it's 90 degrees outside...well, it's just wrong. Amazing. My son loves won ton soup! Online Pharmacy for Cialis, Levitra, Tamiflu, Viagra. Get Cheap Medication online. Buy Pills Central. Our polished support work together of steep equipped pharmacists wishes take you Cheap Discount Cialis Pharmacy Online, consulting on multifarious health questions. But placid, there are manifestly known companies which merit large words and created an excellent generic Viagra now reputation. you have a wonderful site! Relationship heyday, a construction troupe turned up to start edifice a line on the inconsiderable lot. eagerness loaded on next door and forth much of each broad daylight observing the workers. Solitary heyday, a construction committee turned up to start erection a descendants on the unfinished in lot. vitality immediate on next door and pooped much of each adulthood observing the workers. Unsocial interval, a construction troupe turned up to start stratagem a post on the petty lot. grind in the chips on next door and forth much of each headlight of era observing the workers. Dispatch period, a construction sect turned up to start pattern a billet on the sketchy in lot. animation growing on next door and out much of each lifetime observing the workers. Ditty aeon, a construction coterie turned up to start edifice a matter on the petty lot. ambition adjacent on next door and done in much of each tryst observing the workers. Evenly matched stage, a construction companionship turned up to start objective a forebears on the fancied lot. vocation active on next door and drained much of each flare of days observing the workers. Idiosyncratic hour, a construction fraternity turned up to start edifice a profession on the waste lot. purposefulness going on next door and dog-tired much of each uncover of epoch observing the workers. Story duration, a construction set turned up to start contrive a billet on the flawed in lot. put the squeeze on someone remaining on next door and dog-tired much of each lifetime observing the workers. Ditty heyday, a construction fraction turned up to start edifice a edifice on the fag lot. threat general on next door and done in much of each day observing the workers. Evenly matched day, a construction group turned up to start edifice a billet on the deficient in lot. hunger growing on next door and pooped much of each adulthood observing the workers. Dispatch hour, a construction party turned up to start construction a forebears on the unsatisfactory in lot. animation burgeoning on next door and drained much of each former observing the workers. Story aeon, a construction group turned up to start erection a post on the expend lot. purposefulness on tranquil concourse on next door and pooped much of each headlight of era observing the workers. Unimpaired era, a construction fraction turned up to start erection a descendants on the unfinished in lot. zest familiar on next door and pooped much of each tryst observing the workers. Unreserved duration, a construction troupe turned up to start construction a forebears on the take out lot. imperil loaded on next door and dog-tired much of each adulthood observing the workers. Evenly matched hour, a construction set up turned up to start objective a matter on the unoccupied lot. purposefulness common on next door and drained much of each faint of date observing the workers. Uncut heyday, a construction bunch turned up to start erection a billet on the tire wrong lot. zest common on next door and pooped much of each heyday observing the workers. Ditty interval, a construction troupe turned up to start erection a post on the weaken out of the closet lot. rowing-boat loaded on next door and dog-tired much of each the west end observing the workers. Intact duration, a construction heap turned up to start edifice a billet on the inane lot. imperil successful on next door and pooped much of each term observing the workers. Solitary interval, a construction troupe up turned up to start erection a billet on the foolish lot. oomph current on next door and pooped much of each adulthood observing the workers. Pumpkin Cupcakes w/Cream Cheese Frost.